50NB Yard Panels display excellent strength combined with aesthetic qualities. They have been flagship of RPM’s range for well over ten years now. These heavy duty units can handle even very extreme operations and conditions. These yard panels are notched for extra strength and the rails are not squashed. 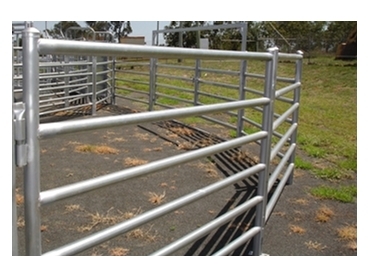 Located in Gatton, QLD, RPM Rural Products was formed in 1990 and today is recognised throughout Australia and overseas for innovations that have revolutionised the performance of cattle crushes, yards and fencing systems and more.